National Health Blog Post Month, Day 30: Play that horn. Want to hear a secret? You’re awesome. (It’s actually not even really a secret.) This is going to be hard for you, O’ Modest One, but you gotta give yourself props today. Write three things you love about yourself – things you’re great at – or just want to share. Don’t you dare signpost or undercut those self-compliments! I’m fighting off a cold or the flu or something, so I feel pretty accomplished even getting a post out today. The fact that it is the end to a 30 day challenge makes me super excited! I managed to post 28 times this month, factoring in two free days gifted to participants of National Health Blog Post Month by the WEGO Health team. Holy cow! I tried to do the HAWMC challenge back in the Spring of this year, but due to blog technical issues and not being able to post for a week, I fell too far behind and couldn’t catch back up. To say that this month was a challenge is no joke. With all the daily posting this month, I spent Thanksgiving with family, went to Disney World, participated in World Diabetes Day events, dug up some stories that I haven’t thought about in a long time, survived a zombie attack, shared some things that a lot of people would have left unsaid, and even had a good sit down with myself and told me how things are going to be. I am an adventurer. I love to go places and do things that many folks wouldn’t do. 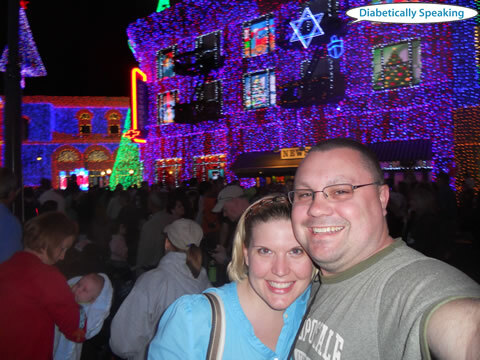 The fact that I have diabetes as a travel companion makes those adventures even more awesome, because I’m able to share that there is nothing that we can’t do with diabetes. We may have to pack a few more supplies, but we’re still able to be in the middle of it all, and not hold back. I love to laugh at and with the world and people around me. I am a joker, a prankster, and I fancy myself an entertainer. The greatest gift you can give someone is the ability to laugh at a difficult situation. If you can laugh at it, you can survive it. I’m also slow, deliberate, and patient. I want to see people and things be the best that they can be. I understand that sometimes that takes awhile to accomplish. I don’t typically rush into things, but I think about them, and then commit after I feel like I’ve examined the possibilities and determined the best course of action for me. This behavior drives a lot of people around me insane, I’m sure, but once I commit to something, you can bet that I’ve done the research, I’ve thought about the outcomes, and that I know the best path to get there that yields that greatest rewards. Now that we are at the end of this 30 day challenge, I challenge all of you that have started and continued to read this nonsense on my blog to take some of the ideas I’ve shared and carry them forward. I love a good success story, and I know that my story and the stories of so many others are only just getting started. National Health Blog Post Month, Day 28: Say WHAT?! What’s the most ridiculous thing you’ve heard about health or your condition? Was there any context? What did you think at the time you heard it – and what do you think of it now? I can handle the ridiculous and imaginative ideas for curing diabetes that people in the publishing business come up with in order to sell copy and get clicks on their websites. I know, as well as they know, that they are often full of crap. Just look at the Reader’s Digest issue from a few months ago. It’s capitalism, and it’s meant to make money. We, as people with diabetes, regardless of type, have to make sure that we are smarter than the fly-by-night snake oil salesmen. I get extremely upset with doctors who tell parents and children who are newly diagnosed that there will be a cure within five years. Or ten years. Or that it is just around the corner. I was told that when I was diagnosed at age two. That was 30 years ago. I’m not saying that we shouldn’t all have hope, but our efforts would be much better suited if we focused on living well with our diabetes (regardless of type), rather than surviving just long enough until there is a cure. What’s the point in a cure if we don’t make it that long? If there was a cure for diabetes, it would not require me to buy someone’s book off of a TV infomercial or sign up for an annual subscription to a website. A cure would be grounded in science, and would include known experts in the field of diabetes who live with and work with this disease every single day that would be more than willing to vouch for whatever form and type of diabetes the cure is for. I also believe that we would see it coming. True researchers dedicate their lives to finding a cure for diabetes. They don’t accidentally mix up samples and say, “Oh, wow, a cure for diabetes. How’d that happen?” So many people are stakeholders for diabetes improvements, and they have their fingers on the pulse of the research that is being done towards better treatments and a cure. The things that I’m excited about right now are insulin pumps with low blood glucose suspend functionality. Basically, if the continuous glucose monitor (CGM) senses a blood glucose that is below a certain level, then it will automatically suspend the insulin pump for a period of time. I have low blood sugar unawareness, so this would be helpful to me to ward off severe lows, like the 35 that I had while I was at Epcot last week, and maybe even prevent me from having a low BG related seizure. I’m also excited about CGM sensors that aren’t as invasive as what we have now. My biggest hurdles in wearing my CGM are the components themselves. I love the results, and the data that I get from it, but having to harpoon myself with a fat needle to insert my sensor and then attach a big honkin’ transmitter to it and tape it down so that it doesn’t fall off is really a burden sometimes. I remember the first home BG meters. They were huge, and heavy, and slow. Today they are tiny, and can report BG’s in five seconds, so I know we will get there with CGM technology as well. As long as research and development is being done, and we are advocating for our needs, progress is inevitable. It just takes time. National Health Blog Post Month, Day 27: Quote Unquote. Grab a quote from this site (type in any word – see what comes up!) and use that quote to set your writing. One of my favorite bands, Our Lady Peace, released an album in 2000 titled Spiritual Machines that was inspired by concepts from the book “The Age of Spiritual Machines” by Ray Kurzweil. After hearing the album, I was as intrigued as the guys in the band, and had to dig a little deeper. There are many quotable passages in the book, and in different scenarios it appeals more than others. I make no bones about the fact that I am a tech geek. I love and live technology. I can spend way too much time keeping up with tech news, advancements, and creative ways that people use technology to solve real world problems. This book was right up my geeky alley. If you have diabetes, especially Type 1 diabetes, you probably walk around with a myriad of technology at any given time. This does not speak to everyone (or every type of person with diabetes, YDMV), but it isn’t unheard of to hear of someone walking around several devices attached to them or nearby that are helping them to make decisions that keep them alive. I’m an example. I have a continuous glucose monitor (CGM) that gathers information from a flexible sensor residing just under my skin and a wireless transmitter. My CGM is integrated with my insulin pump, and helps me to maintain better control with my blood glucose (BG) levels by tracking trends so that I can see when my BG is rising or falling. My insulin pump is connected to me via a similar type of cannula, though this one is linked to my pump via a nearly three foot tube. My insulin pump, powered by battery and programmed to my individual insulin needs, doses very small amounts of insulin around the clock through that tube, with bigger doses occurring when I eat a meal or have a high BG that needs correcting. I also carry around a standard issue fingerprick BG kit that tells me what my BG is at any given time with more accuracy than my CGM alone. I have other, more multipurpose pieces of technology that I use to help me manage my life with diabetes as well. I have my cell phone (smartphone) and iPad that I use to look up carbohydrate info, keep in touch with the Diabetes Online Community (DOC), and search for other info that I might need on the fly to better manage my diabetes. One of my favorite apps to use when carb counting is the Go Meals app, especially when I go out to eat. I feel like, in many ways, Kurzweil’s vision of a 21st century where computational technology is used to change the nature of mortality has already come true, though we still have miles to go before we sleep. When I was diagnosed with diabetes over 30 years ago, the information and data that we have today was simply not available. Now, we can figure out how many carbs are in a meal at a restaurant by the time a server can return to the table with our drink order. The swiftness of information is only going to get better, and the quality will continue to improve as well. I’m excited to see what is next with technology used to live with and manage this disease, and how our world with diabetes will continue to evolve. I believe that one day there will be a cure, but until then, I am thankful that technology keeps improving to keep us alive and well until we get there. National Health Blog Post Month, Day 25: Never Have I Ever. You stick to your guns – now tell us about what. What is something you’ve never done but want to? What’s something you’ve never done and won’t budge on? Growing up, Thanksgiving for me was staked in tradition. All of my family would get together at my grandma’s house for the full Thanksgiving spread: Turkey, ham, stuffing, peas, cornbread, green bean casserole, cranberry sauce, pies and cakes galore, and more. Over the years though, tradition has been replaced with change. People’s lives take a turn, some for the better, others for the different. Family members that I grew up with all have families of their own now, and we have moved into our own lives, where many of us have formed our own traditions. Last year for Thanksgiving, A-Flizzle and I were in the Caribbean. 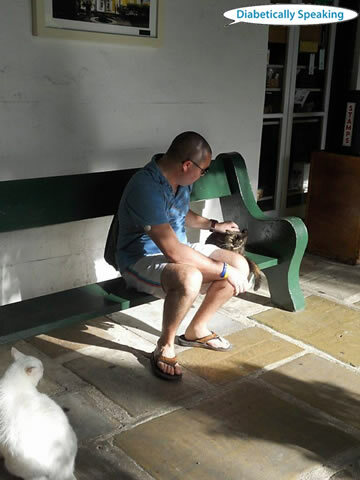 We were in Key West petting six-toed cats at Ernest Hemingway’s house. 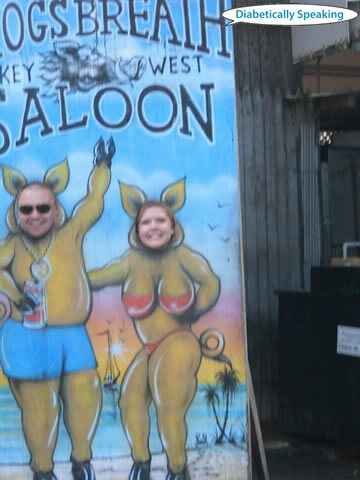 We were having a great time at the Hog’s Breath Saloon. 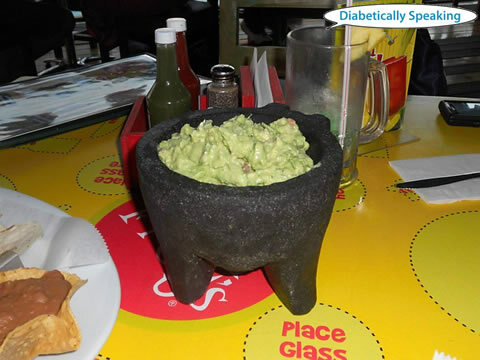 We were sitting in the Bahamas having guacamole that was made fresh right in front of our very eyes. We were on an island, enjoying the sun. We were snorkeling above underwater plane wreckage and shipwrecks. We were drinking copious amounts of Diet Coke that we had to climb several flights of stairs on a cruise ship to get refills for (totally worth it, by the way!). With that same spirit in mind, but not having quite the same amount of time to get away this year, we decided to go to Disney World for Thanksgiving. We had some time left on our tickets that we had purchased during Friends For Life last summer, and we needed to use them before the end of the year, so we figured…why not? 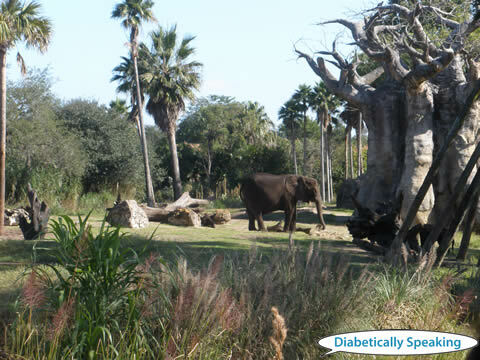 We spent the day yesterday at Animal Kingdom ogling the wildlife and having wild adventures. At Epcot, we got educated Disney-style and traveled back to the 80’s with a little Captain EO. 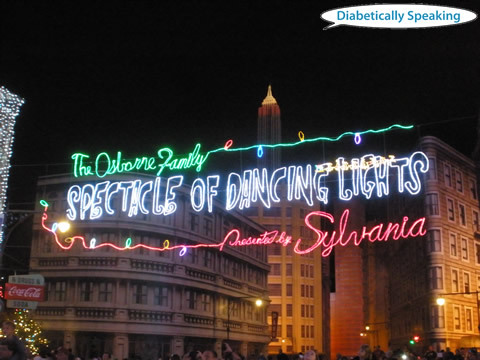 At Hollywood Studios, we proceeded to get into the Christmas spirit with The Osborne Family Spectacle of Dancing Lights. Aside from losing my cell phone and a low BG of 35 that sneaked up on me at Epcot, which was fortunately caught and corrected without incident, it was a pretty awesome Thanksgiving. There was a time when I would have said that I wouldn’t miss the time with my family on Thanksgiving. I feel like I haven’t budged on that ideal. I’ve just twisted the rules a little bit. Have family, will adventure. Even on holidays. 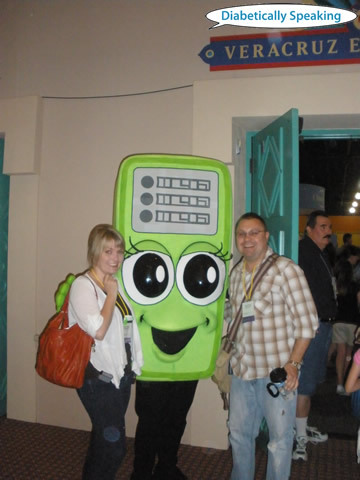 National Health Blog Post Month, Day 24: My Mascot! Give your condition, community, or self a mascot. Who is it? What do they represent? What is their battle cry? Dictionary.com defines a mascot as “an animal, person, or thing adopted by a group as its representative symbol and supposed to bring good luck.” I feel like there are a lot of potential candidates for a diabetes mascot. First, there is this thing that Jacquie and I found at Friends For Life last summer. I’m not even sure what it is. Is it an insulin pump? Is it a BG meter? Is it a calculator? Is it a magic robot with an affinity for sideways exclamation points? 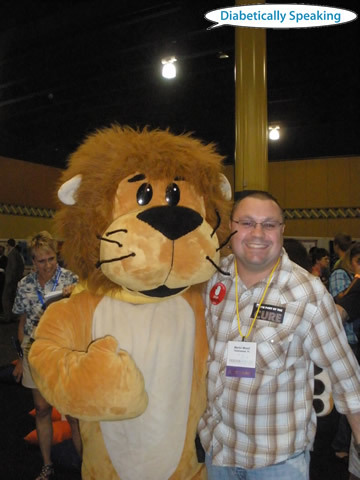 Then there is Lenny the Lion. Granted, he’s already got a full-time gig as the Medtronic mascot, but he does have the advantage of being well-versed with an insulin pump. And think, with those cat claws, you would never have to replace a lancet ever again! Coco is a great candidate for a mascot as well. She has Type 1 diabetes. She has lots of friends and lots of adventures. She’s a lot like me! Except her primary contribution to conversations is “Eeek!” But I know people that have a lot more to say than just “Eeek!” and I wish they were as limited in their vocabulary as Coco is, so maybe that isn’t such a bad thing. You know what they say (whoever “they” are)…a little “Eeek!” goes a long way. 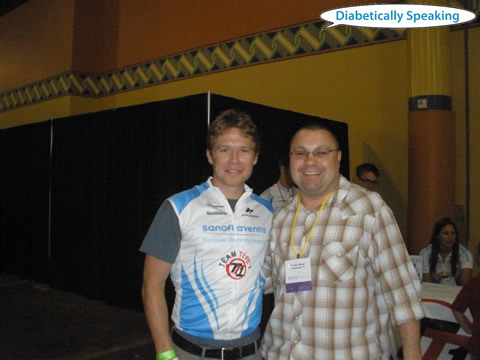 There is also Phil Southerland, who makes a great representative for the diabetes community. He’s a cyclist and co-founder of professional cycling’s Team Type 1-Sanofi, author of Not Dead Yet, and he’s from where I live, Tallahassee, Florida. He was also recently appointed Director of Healthcare Policy, Planning and Patient Advocacy at the World Health Organization. And he has Type 1 diabetes. I think any of these candidates would make a fine diabetes mascot. However, I’m glad we don’t have to pick just one. 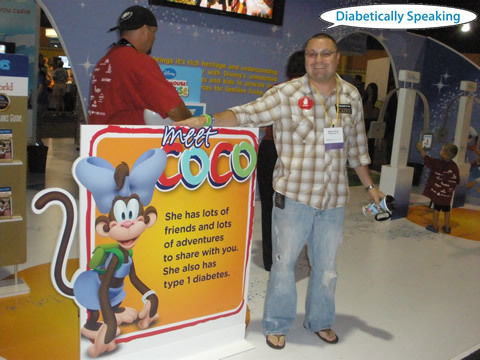 The more characters there are in the world advocating and representing and bringing diabetes to the forefront of people’s attention, the better. National Health Blog Post Month, Day 23: Health Activist Choice. Write about whatever you want! It’s Thanksgiving week, and Mike over at My Diabetic Heart has brought back Diabetes Blessings Week for the second year in a row. I was missing in action over the week of Thanksgiving last year, so I am excited to participate this year. 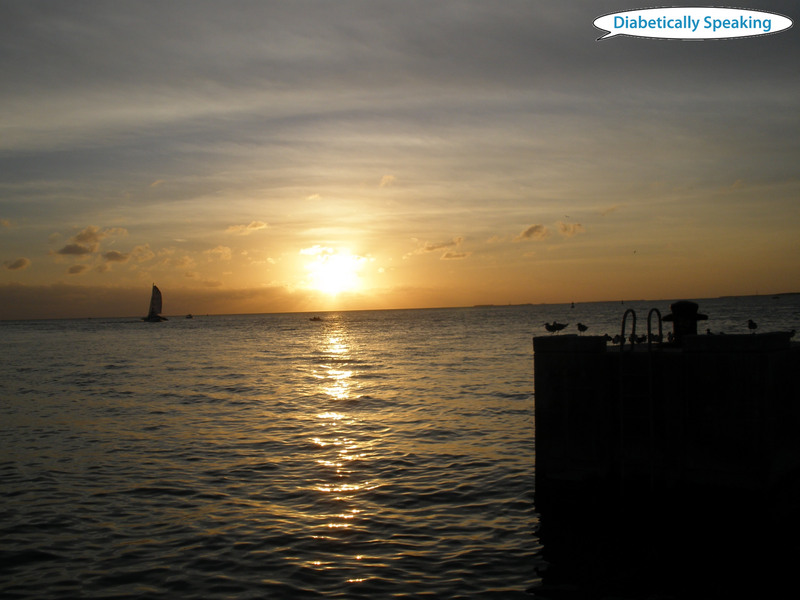 It’s immensely important for people with diabetes to know that there are a ton of things that come along with diabetes that are totally worth being thankful for. 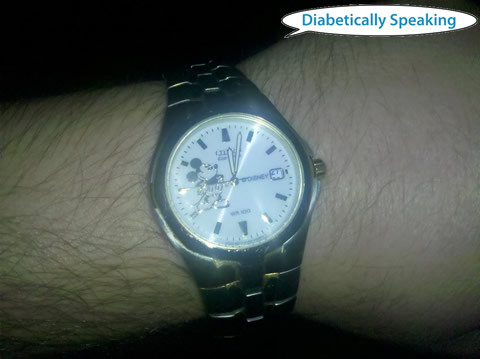 Second, us people with diabetes tend to be more in tune with your body than most people without diabetes are. I think that is really cool. Because of our obsessive compulsive disord…um, attention to detail, we can live just as long as people without diabetes, and often without complications because we are able to catch many problems before they are a big deal. So congratulations to the newly diagnosed, you’re going to live forever! Or at least as long as the national average, which isn’t too bad at all these days. Speaking of people with diabetes, those folks are worth being thankful for as well. Sure, diabetes is a lifetime commitment, but you get to join the finger pricker armed forces of the world in a battle to save mankind…who happens to have diabetes. 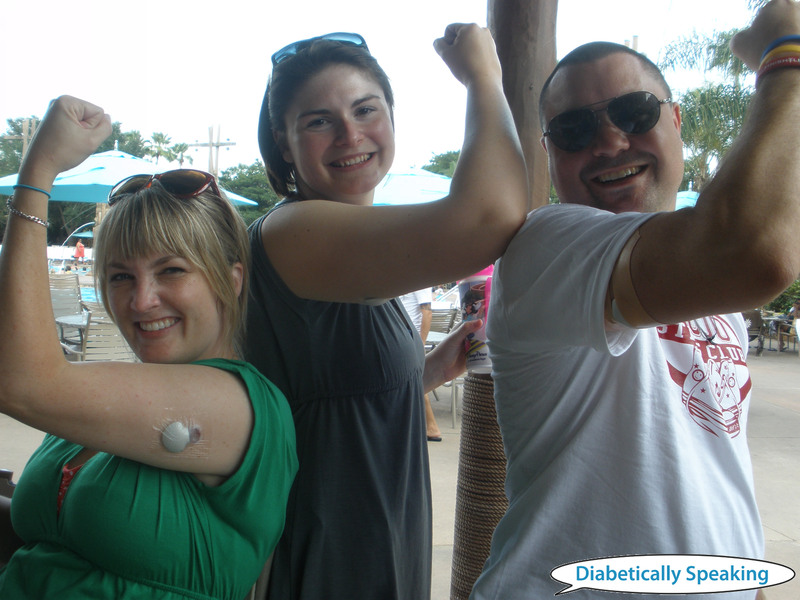 The folks that I’ve met in my world that embrace and encourage me AND my diabetes are those that I cherish the most. I remember days when “normal” was me hiding my diabetes as soon as I left the house. I would so adamantly do whatever I wanted in order to try and be like everybody else, and not let diabetes steal my spotlight. I’m not talking about wild behavior, but just simple things like driving a car, going to work, walking across a busy six-lane street (while low!) to get a snack. I mean, really? What was wrong with me? I’m thankful for so many things in my world, but what I’m thankful for the most is the fact that I’m still here and able to be thankful. National Health Blog Post Month, Day 22: Be present. Describe something peaceful with as much sensory imagery as you can. What are the sights, sounds, scents, and feelings? Peace, in my world, is that elusive thing that peeks its head out from around a corner every once in awhile, letting you have only a short glimpse, before quickly scampering off into the chaotic wilds of the land of To Do. I am one of those people who packs their day full of stuff to do (often unintentionally) from the moment my feet hit the ground in the morning to when I set my alarm and turn my light off at night. My days are packed with diabetes concerns, work concerns, BG tests, tasks and things I need to get accomplished, phone calls, emails, spreadsheets, web pages, beeping CGM’s, carb counting, questions and answers, and even unknowns. Lately, I really haven’t found a peaceful, blissful place where I’m not bombarded with a list of things that I can’t get my mind off of that I should be doing instead of enjoying the serenity. But I know a few places where I am the most at ease, and I hope I can get there to spend some time before long. The beach at dusk and night is one of my favorite places to get away from it all. Even if for only a few minutes. I like the beach during the day, don’t get me wrong. I love it. But at night, it’s different. At the beach at night, the waves seem to crash just a little more gently. The breeze seems to blow just a little more calmly. The darkness helps to retire the beachgoers from the day, replacing them with footprints, disappearing sandcastles, and subtle reminders that yes, this beach belongs to all, but the small bit of solitude that remains is mine. I don’t have to share the beach at night. A cell phone or an iPad has no place here. There is no light to read a book, a newspaper, or a magazine. There is only the subtle reflection of the setting sun on the water, painting the sky a series of pinks, purples, oranges, and gold. Or maybe it’s the vision of the moon slowly climbing its way out of the water at the edge of the horizon, giving off a soft pale glow, and letting gravity take the water as it rises higher and higher in the sky. The sounds of the beach are hypnotizing. The waves crashing against the shore in a never ending loop have the nature of the stars, in that they are nearly impossible to count and keep track of. They keep repeating, with no story of where they have come from, or where they are going next. The water slapping against a pier, or a seawall, adds a backbeat rhythm for the waves to keep time to. The smell in the air is crisp, clean, yet salty. The lingering sweet smell of suntan lotion hovers around the public areas. Along the pier you can smell the freshness in the daily catches of the fisherman, who are still at their task of gathering just enough fish for dinner, and leaving behind just enough for tomorrow. If you close your eyes, and take a deep breath in, you can feel the energy of the day slowing down, wrapping up the fond memories and new beginnings of every person’s day at the beach before you. As you breathe out, the world is replaced by calmness unlike any other, and a feeling of life all around, but moving at a slower pace, with beautiful deliberateness. You can stay for a moment, or you can stay for hours. The beach at night has no time clock. It is just there, winding down from a long day in the sun, and glad that you stopped long enough to give it a chance to share.